I can taste the change in the air. It tastes like... Three Musketeers. And Reese's Peanut Butter Cups. Maybe a Nutter Butter that I can't decide if I like. Certainly candy corn that I know I don't like. And those Hershey's miniatures that I know I do like. Seriously, how did it get to be October already? And why is there no Halloween candy in my house yet? I am still clinging to summer, wearing short sleeves in the day and forgetting to turn on the heat at night. It was a great summer, and I was sad to see it end. But I love fall too. Especially perfectly crisp blue-sky days. We've had a bunch of those lately, and I'm looking forward to more before winter descends. 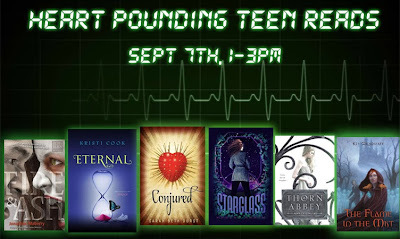 I'll be reading from and talking about my new YA book Conjured at all of these. 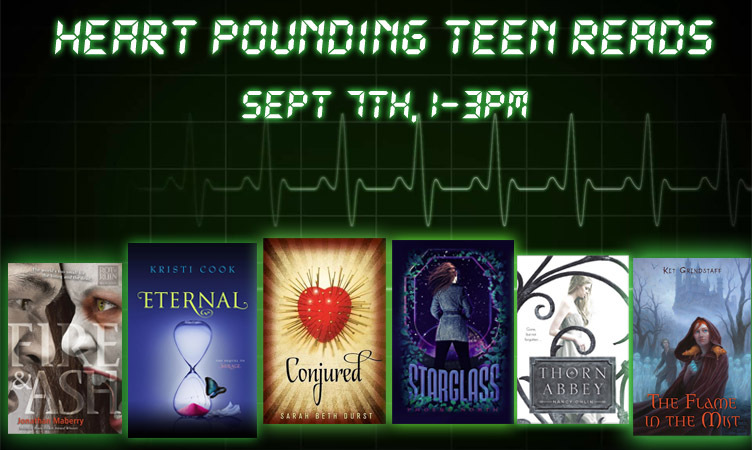 If you're in the area, I hope you'll come say hello! I love, love, love it! The haunted look in her eyes... the guy's creepy smile... the carnival-esque music... Huge thanks to all the Bloomsbury folks who worked to create this. I couldn't be more thrilled! Event Announcement: Books of Wonder, this Saturday! Books of Wonder is one of my favorite bookstores in the whole world and they always do wonderful events. I can't wait! Hope to see you there! 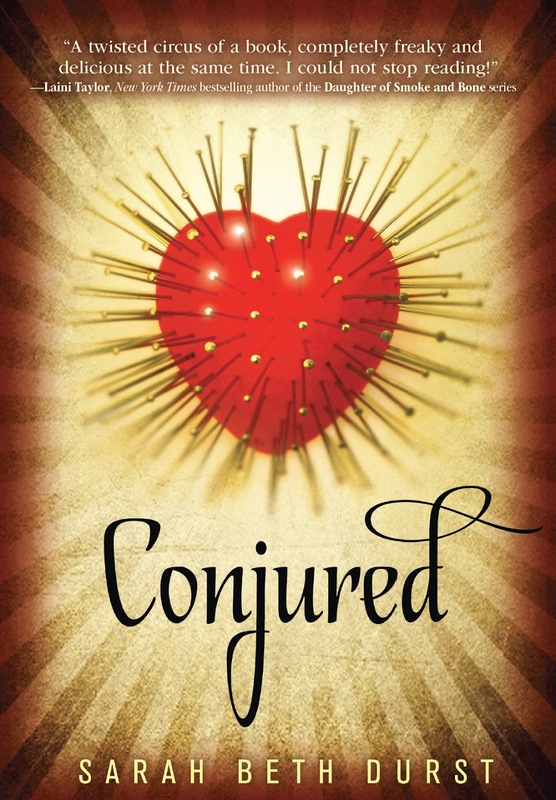 I am thrilled to announce the release of my new book, CONJURED!!! This is, by far, the creepiest and wildest book I've ever written. It was so much fun to write! And as of today, it is out in the world!!! CONJURED is a fantasy novel for young adults, published by Bloomsbury / Walker Books for Young Readers. It's about a girl in the paranormal witness protection program, who, haunted by visions of carnival tents and tarot cards, must remember her past and why she has strange abilities before a magic-wielding serial killer hunts her down. Laini Taylor, New York Times bestselling author of the DAUGHTER OF SMOKE & BONE series, called it: "A twisted circus of a book, completely freaky and delicious at the same time. It's a thriller, a fairy tale nightmare, and a romance all in one, unlike anything else and impossible to predict. I could not stop reading!" CONJURED crept up on me. I'd planned to write a police procedural about a federal marshal who works for the paranormal branch of the witness protection program... but when I began to develop the case that the marshall was working, the witness herself, Eve, a girl with zero memories and lots of bizarre powers, drew more and more of my attention. The instant she made the birds in her wallpaper fly around her room, I knew the story had to be hers. Writing this book felt a lot like leaping out of an airplane. (Minus the risk of broken bones.) I broke a lot of writing rules in order to tell Eve's story through her eyes, the way it needed to be told. Eve is a blank slate character. She begins with essentially no identity. So instead of a reader discovering who she is, the reader comes along with her as she creates who she is. I dedicated this book to Andrea Somberg, my agent. Without her, this book wouldn't exist. Without her, none of my books would exist. She is, quite simply, a dream-maker (as well as an incredibly awesome person). I've wanted to be a writer since I was ten years old. It's the only thing that I've ever wanted to do with my life. I wrote my very first story in fifth grade, and I kept writing and writing and writing... After college, I started seriously pursuing publication. I finished my first novel-length manuscript and sent it out. And then I wrote another and sent it out. And then wrote another... I refer to this period as the "rinse, lather, repeat" stage of my life. In 2006, the stars aligned, and I signed with Andrea Somberg of the Harvey Klinger Agency. Six weeks after that, she had multiple offers for my debut novel, INTO THE WILD. She's believed in me from the start. And in the years since then, she's made my dream come true many, many times over. To date, she's sold 11 novels for me. (CONJURED is #7.) And I've come to know her as an incredibly kind, smart, and all-around amazing person. So I'd like to say thank you to Andrea and thank you to my wonderful editor Emily Easton and all the amazing people at Bloomsbury/Walker for bringing this book to life! More about CONJURED, including the first chapter, can be found here.